Dave Stafford, June 2013: after some forty years of work in music, a new phenomenon came along that literally changed everything: applications. in the past, to make music, I needed guitars, keyboards or other instruments to make sound, sometimes, using computers to help me, but never before could I create music using an inexpensive application running on an apple tablet - and, create professional, fully-fledged pieces of music to boot. despite being a traditional player, who learned piano as a boy and played guitar in many a garage band growing up - I took to this new technology like a duck to water - in late 2011, I acquired an ipad 2, and started working with some of the amazing and remarkable music applications that are available. it just seemed...right, a technology that would allow anyone to create music, whether they had musical knowledge or not, but, having musical knowledge, being able to read music, I feel gave me at least a slight advantage...I could manipulate these tools to make the best music possible (or so I hope). I began collecting music applications, downloading them, trying them, and if they seemed promising, I would begin recording in earnest with them. one of the first serious music apps I downloaded was the fairlight pro (which is now named “peter vogel cmi”, by the way - but I still call it “the fairlight”) which I struggled a bit, to be honest, to learn, because of a gap in my knowledge: I’d never learned how to sequence. a few weeks passed, and...I learned to sequence. I embarked on a career of recording fairlight sequences whenever I could find the time; getting used to the remarkable library of samples, and how to assemble the samples into brand new pieces of music. in an eighteen month period, I worked on about 70 sessions with “the fairlight”, which yielded 45 complete tracks, and an additional 24 early mixes, alternative mixes, incomplete pieces, etc., which remain unreleased. I also recorded many, many other pieces with many, many other applications, and in fact, in this year and a half period, I became so incredibly prolific thanks to the ipad and thanks to the incredible number of really robust, powerful music applications, that it took me some time to come up with a solution for how to make this “new music” available to listeners - and it was then (probably in about mid- 2012) that I hit on the concept of the “eternal album” - which I describe in detail on the bandcamp site for this album. it took me about a year to work out how the eternal album would “work”, and this summer, in june, 2013, I sat down to remaster the entire dave stafford “fairlight pro” catalogue for the express purpose of making it available in this new format, the “eternal album” - on bandcamp (which has the advantage too, of allowing folk to listen before they buy - a very important feature that I heartily approve of). in brief, the “eternal album” is an open-ended album, with no finite number of tracks, and no completion date - I will continue to add tracks to it as they become available. in this first instance, I’ve uploaded all 45 existing, available fairlight tracks initially, and then over the coming 30 - 40 years, I will simply add more and more tracks as I create them - and whatever the current total of available tracks is - “that” is the “album”. obviously, customers can pick and choose what tracks they like, and create their own “version” of the “fairlight album”, with as few or as many, or all of the tracks, if they so desire - a very flexible arrangement I feel. 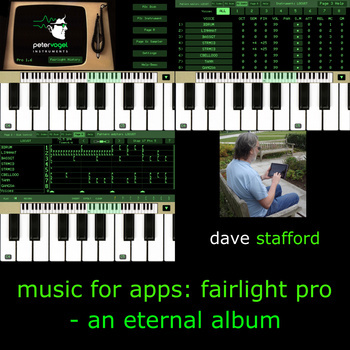 “music for apps: fairlight pro” is the first of many “eternal albums” that I foresee, each album focusing on music made with a specific ipad application. the next , the second “eternal album” will focus on music made with “scape” - the generative ambient music creation app created by brian eno and peter chilvers. I will still create traditional albums, with finite tracks, for projects I make with traditional instruments - guitar, electric guitar, guitar synth, bass, piano, keyboards, drum machine, synthesizers. I will still make my “normal” ambient albums as well, as I’ve always done. but - as an adjunct to that, and, to deal with the amazing proliferation of tracks that creating music with apps seems to espouse - I will create many of these open-ended, “eternal albums” - one for each application that I work with. please see the entry for the next album, “music for apps: scape”, which is coming soon, to read what happens next - the previous record is “gone native”.